Woolly mammoth is the common name for an extinct elephant of the mammoth genus, Mammuthus primigenius, characterized by long, strongly curved tusks, a dense coat of hair, and hind legs much shorter than the forelegs, giving a slope to the back. It is also known as the tundra mammoth. Fossils of the woolly mammoth trace from about 250,000 years ago to 4,000 years ago. This animal is known from bones and frozen carcasses from northern North America and northern Eurasia, with the best preserved specimens in Siberia. The woolly mammoth has captured the human imagination since the first fossils were encountered, leading to speculation about giant underground mole-like animals, biblical behemoths, and animals whose demise was caused by the great deluge. Today, they remain a fascinating subject matter, particularly given that their existence coincided with that of humans. The cause of their extinction, and the role of human hunters in this extinction, remains hotly debated. As an elephant, woolly mammoths belong to the family Elephantidae in the order Proboscidea in the class Mammalia. Within this family, mammoths comprise the genus Mammuthus, and the woolly mammoths belong to the species Mammuthus primigenius. In general, elephants are characterized by thick skin, large tusks, large pillar-like legs, large flapping ears, and a proboscis, or trunk, that is a fusion of the nose and upper lip. There are only three living species, but many other species are found in the fossil record, having become extinct since the last ice age. The woolly mammoth is one of the best known fossil vertebrates, with significant finds for over 100 sites in North America and Eurasia, including frozen and mummified carcasses (ANSP). There also are cave drawings of these mammoths. The woolly mammoth is characterized by hind legs much shorter than forelegs, which results in the back having a pronounced slope. Their skull has a large dome on the top, and their ears are smaller than those of modern elephants. The tusks were much larger than modern elephants, sometimes greater than 4.2 meters (13.5 feet) in length, and while elephant tusks are generally straight, those of the woolly mammoth were strongly curved upward (ANSP). Their molars were like those of other elephants in being large, complex, specialized structures, with low ridges of dense enamel on the surface. During a lifetime, a total of six massive cheek teeth (molars and premolars) develop on each side of both the upper and the lower jaw (for a total of 24 teeth). Only two were in use at any one time, because the mouth did not offer enough space, but as successive teeth grew forward from the back of the jaw, the earlier, smaller teeth would be replaced and drop out (ANSP; Harington 1995). Woolly mammoths generally had about the same height (2.8 to 3.4 meters, or nine to 11 feet) and weight (four to six tons) as the Asian elephants (ANSP). However, fossil evidence of dwarf woolly mammoths was found on Wrangel Island, north of Siberia, within the Arctic Circle. It was possibly due to their limited food supply that these animals were a dwarf variety, thus much smaller than the original Pleistocene woolly mammoth (Vartanyan et al. 1993). The Wrangel Island mammoths should not be confused with the Channel Islands pygmy mammoth, Mammuthus exilis, which was a different species. Woolly mammoths had a number of adaptations to the cold, most famously the thick layer of shaggy hair, up to 50 centimeters (20 inches) long, for which the woolly mammoth is named. They also had far smaller ears than modern elephants; the largest mammoth ear found so far was only 30 centimeters (11.8 inches) long, compared to 180 centimeters (70.5 inches) for an African elephant. Their teeth were also adapted to their diet of coarse tundra grasses, with more plates and a higher crown than their southern relatives. Their skin was no thicker than that of present-day elephants, but unlike elephants they had numerous sebaceous glands in their skin which secreted greasy fat into their hair, improving its insulating qualities. They had a layer of fat up to eight centimeters (3.15 inches) thick under the skin which, like the blubber of whales, helped to keep them warm. 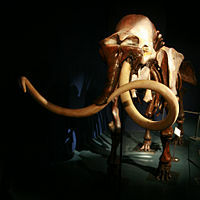 It is not clear whether the extremely long and markedly curved tusks of woolly mammoths were a specific adaptation to their environment, but it has been suggested that mammoths may have used their tusks as shovels to clear snow and ice from the ground and reach the vegetation buried below (Harington 1995). This is evidenced by flat sections on the ventral surface of some tusks (Harington 1995). It has also been observed in many specimens that there may be an amount of wear on top of the tusk that would suggest some animals had a preference as to which tusk it rested its trunk on. The earliest fossils of woolly mammoth are from about 250,000 years ago, but these were transitional forms, with more advanced forms appearing later (ANSP). By about 100,000 years ago, the woolly mammoth was found from the British Islands through Siberia into North America (ANSP). The woolly mammoth was first recorded in (possibly 150,000 years old) deposits of the second-to-last glaciation in Eurasia (Harington 1995). It is believed they derived from steppe mammoths (Mammuthus trogontherii) (Harington 1995). There is speculation that woolly mammoths originated in north-central Eurasia and spread westward to England and Spain and eastward to North American, via the Bering Isthmus (Harington 1995). The complete mitochondrial genome sequence of Mammuthus primigenius has been determined (Krause et al. 2006). The analysis demonstrates that the divergence of mammoth, African elephant, and Asian elephant occurred over a short time, and confirmed that the mammoth was more closely related to the Asian than to the African elephant. The assembling of a complete mitochondrial DNA of the mammoth allowed researchers to trace the close evolutionary relationship between mammoths and the Asian elephant, and to ascertain that African elephants branched away from the woolly mammoth around six million years ago, a moment in time close to that of the similar split between chimps and humans. 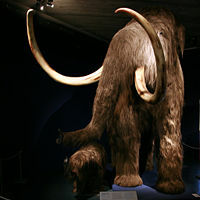 Many researchers expect that the first fully sequenced nuclear genome of an extinct species will be that of the mammoth. The woolly mammoth was the last surviving mammoth. Most populations of the woolly mammoth in North America and Eurasia died out at the end of the last Ice Age, about 12,000 to 10,000 years ago. A definitive explanation for their mass extinction is yet to be agreed upon. A small population survived on St. Paul Island, Alaska, up until 6000 B.C.E. (Guthrie 2004; Schirber 2004), and the dwarf woolly mammoths of Wrangel Island in the Arctic Circle survived at least until 4,700 years ago (ANSP), with some radiocarbon dating evidence placing their extinction only around 2000 B.C.E. (Vartanyan et al. 1995; ANSP). Some place the disappearance of the dwarfed race on Wrangel Island closer to 1700 B.C.E. (Nowak 1999). Most woolly mammoths are believed to have died out at the end of the Pleistocene as a result of climate change and a shift in man's hunting patterns. A recent study conducted by the Museo Nacional de Ciencias Naturales in Spain determined that warming temperatures had reduced mammoth habitat to only a fraction of what it once was, putting the woolly mammoth population in sharp decline before the movement of humans into the territory (Nogués-Bravo et al. 2008). Glacial retreat shrunk mammoth habitat from 7,700,000 square kilometers (2,970,000 square miles) 42,000 years ago to 800,000 square kilometers (310,000 square miles) by 6,000 years ago. Although a similarly drastic loss of habitat occurred at the end of the Saale glaciation 125,000 years ago, human pressure during the later warming period was sufficient to push the mammoth over the brink (Sedwick 2008). The study employed the use of climate models and fossil remains to make these determinations (Nogués-Bravo et al. 2008). The preserved baby woolly mammoth named Dima (Lucerne, Switzerland). One-of-a-kind stuffed mammoth in The Museum of Zoology, St. Petersburg, found in the banks of the Berezovka River. The woolly mammoth is among the more common finds in the fossil record, and were long familiar to Siberian aboriginals, some of whom apparently believed they were giant, underground, mole-like animals that died upon emerging from their burrows. In the seventeenth century, accounts of these remains led to such speculations among Europeans that they were the remains of human giants, elephants, or the biblical behemoth. Once it was determined in the early eighteenth century that these came from elephants, the problem of finding "tropical animals" so far north became an issue, with some concluding their demise was the result of the great deluge, with the flood waters transporting them to this location. Georges Cuvier, in the first paper he published, concluded the Siberian mammoth was distinct from living species, and was indeed an extinct species, and in 1799, Johann Friedrich Blumenbach formally named it Elephas primigenius (ANSP). Unlike most fossils, many specimens of the woolly mammoth actually are preserved since their deaths. This is in part because of their massive size and partially because of the persistence of the frozen climate in which they had lived and, therefore, died. The very first mammoth fossil fully documented by modern science, the Adams mammoth, was of this type. In 1799, a hunter discovered it entombed in permafrost on the bank of a river in Siberia. Thawing, a few years later, freed some of the carcass from the ice, the hunter was able to remove the tusks and sold them. In 1806, Mikhail (Michael) Adams, a Scottish botanist received word of the mammoth while traveling in Russia, but when found it was badly decomposed, although still with considerable patches of hair and skin and most of the skeleton (ANSP). Possibly it had been partially devoured by modern wolves (Granqvist 2005). Preserved frozen remains of woolly mammoths, with much soft tissue remaining, have been found in the northern parts of Siberia. This is a rare occurrence, essentially requiring the animal to have been buried rapidly in liquid or semi-solids such as silt, mud, and icy water, which then froze. This may have occurred in a number of ways. Mammoths may have been trapped in bogs or quicksands and either died of starvation or exposure, or drowning if they sank under the surface. Though judging by the evidence of undigested food in the stomach and seed pods still in the mouth of many of the specimens, neither starvation nor exposure seem likely. The maturity of this ingested vegetation places the time period in autumn rather than in spring when flowers would be expected. (E.W. Pfizenmayer was one of the scientists who recovered and studied the mammoth that was found at the river Berezovka in the early 1900s. He wrote, in 1939: “Its death must have occurred very quickly after its fall, for we found half-chewed food still in its mouth, between the back teeth and on its tongue, which was in good preservation. The food consisted of leaves and grasses, some of the latter carrying seeds. 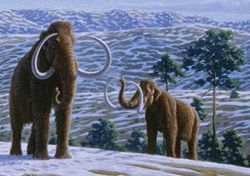 We could tell from these that the mammoth must have come to its miserable end in the autumn.”) The animals may have fallen through frozen ice into small ponds or potholes, entombing them. Many are certainly known to have been killed in rivers, perhaps through being swept away by river floods. In one location, by the Berelekh River in Yakutia in Siberia, more than 9,000 bones from at least 156 individual mammoths have been found in a single spot, apparently having been swept there by the current. In 1977, the well-preserved carcass of a seven to eight-month old baby woolly mammoth, named "Dima," was discovered. This carcass was recovered from permafrost on a tributary of the Kolyma River in northeastern Siberia. This baby woolly mammoth weighed approximately 100 kilograms (220 pounds) at death and was 104 centimeters (41 inches) high and 115 centimeters (45 inches) long. Radiocarbon dating determined that Dima died about 40,000 years ago. Its internal organs are similar to those of living elephants, but its ears are only one-tenth the size of those of an African elephant of similar age (Harington 1995). In the summer of 1997, a Dolgan family named Jarkov discovered a piece of mammoth tusk protruding from the tundra of the Taymyr Peninsula in Siberia, Russia. In September/October 1999 this 20,380 year old carcass and the surrounding sediment were flown to an ice cave in Khatanga, Taymyr Autonomous Okrug. In October 2000, the careful defrosting operations in this cave began with the use of hairdryers to keep the hair and other soft tissues intact (Mol 2001; Debruyne et al. 2003). To date, around forty preserved bodies have been found, but only four of them are complete. In most cases, the flesh shows signs of decay before its freezing and later desiccation. Stories abound about frozen mammoth carcasses that were still edible once defrosted, but the original sources indicate that the carcasses were in fact terribly decayed, and the stench so unbearable that only the dogs accompanying the finders showed any interest in the flesh (Farrand 1961). In addition to frozen carcasses, large amounts of mammoth ivory have been found in Siberia. Mammoth tusks have been articles of trade for at least 2,000 years. They have been and are still a highly prized commodity. Güyük, the thirteenth century Khan of the Mongols, is reputed to have sat on a throne made from mammoth ivory, and even today it is in great demand as a replacement for the now-banned export of elephant ivory. Academy of Natural Sciences, Philadelphia (ANSP). n.d. Woolly mammoth (Mammuthus primigenius). Academy of Natural Sciences. Retrieved May 15, 2008. Capelli, C., R.D.E. MacPhee, A.L. Roca, F. Brisighelli, N. Georgiadis, S.J. O'Brien, J. Stephen, and A.D. Greenwood. 2006. A nuclear DNA phylogeny of the woolly mammoth (Mammuthus primigenius). Molecular Phylogenetics and Evolution 40(2): 620–627. Retrieved May 15, 2008. Debruyne, R., V. Barriel, and P. Tassy. 2003. Mitochondrial cytochrome b of the Lyakhov mammoth (Proboscidea, Mammalia): New data and phylogenetic analyses of Elephantidae. Molecular Phylogenetics and Evolution 26(3): 421-434. Retrieved May 16, 2008. Farrand, W.R. 1961. Frozen mammoths and modern geology: The death of the giants can be explained as a hazard of tundra life, without evoking catastrophic events. Science 133(3455): 729-735. Retrieved May 16, 2008. Granqvist, E. 2005. Mammouth—From their discovery and how to bring them the life. NATHIST annual meeting in Jakobstad. Retrieved May 16, 2008. Guthrie, R. D. 2004. Radiocarbon evidence of mid-Holocene mammoths stranded on an Alaskan Bering Sea island. Nature 429: 746-749. Retrieved May 16, 2008. Harrington, C.R. 1995. Woolly mammoth. Yukon Beringia Interpretive Centre. Retrieved May 15, 2008. Krause, J., P.H. Dear, J.L. Pollack, et al. 2006. Multiplex amplification of the mammoth mitochondrial genome and the evolution of Elephantidae. Nature 439: 724-727. Retrieved May 16, 2008. Mol, D., Y. Coppens, A. N. Tikhonov, et al. 2001. The Jarkov Mammoth: 20,000-Year-Old carcass of a Siberian woolly mammoth Mammuthus primigenius (Blumenbach, 1799). The World of Elephants, Proceedings of the 1st International Congress (October 16-20 2001, Rome): 305-309. Retrieved May 16, 2008. Nogués-Bravo, D., J. Rodríguez, J. Hortal, P. Batra, and M.B. Araújo. 2008. Climate change, humans, and the extinction of the woolly mammoth. PLoS Biology 6(4): e79. Retrieved May 16, 2008. Pfizenmayer, E.W. 1939. Siberian Man and Mammoth. London: Blackie and Son. Rincon, P. 2007. Baby mammoth discovery unveiled. BBC July 10, 2007. Retrieved May 14, 2008. Sedwick, C. 2008. What killed the woolly mammoth? PLoS Biology 6(4): e99. Retrieved May 16, 2008. Vartanyan, S. L., Kh. A. Arslanov, T.V. Tertychnaya, and S.B. Chernov. 1995. Radiocarbon dating evidence for mammoths on Wrangel Island, Arctic Ocean, until 2000 B.C.E. Radiocarbon 37(1): 1-6. Retrieved May 15, 2008. Vartanyan, S.L., V.E. Garutt, and A.V. Sher. 1993. Holocene dwarf mammoths from Wrangel Island in the Siberian Arctic. Nature 362: 337-349. Retrieved May 16, 2008. This page was last modified on 19 August 2008, at 18:48.